If you like to workout and keep yourself in good shape, you are amongst the many who have decided to have their own fitness equipment. And why not? It is way more cheap that having a gym membership and you can do everything from the comfort of your own home. However, preparing for a house relocation is not a simple task when you have to properly pack your gear. You can always leave it behind or sell it but we assure you the gyms in London are not the cheapest place. So let’s get creative and show you how to pack and prepare your fitness equipment for the big moving. Wipe your yoga mat, dumbbells, jumping rope and all the smaller fitness gear with a mixture of water and multipurpose cleaner. Use wet wipes to clean the handles and the surface of the bigger gear like treadmills and ellipticals. All of the towels and blankets that you use needs to be laundered, dried and then placed in a vacuum bag for easy transportation. Make sure they are not moist or else you may have a serious mould problem. Put the yoga mat on the floor and place some of your lighter dumbells on one of its sides. Roll the mat with the dumbells inside. Try to make the roll as tight as possible. Secure it with the mat’s strap or with elastic bands. Pack it in bubble wrap. The dumbells inside will help keep the shape of the map and won’t allow it to be flattened and damaged. If you don’t have light weights, you can use bed sheets or towels as a filling. The big problem here is the boxes you need to use for the transportation to London. Naturally, your weights and dumbbells are heavy which means you need strong boxes. Avoid cardboard and chose plastic. You have many options, but we recommend contacting your preferred moving company and ask them for reusable plastic containers with handles. Chose the size carefully, you would want small or medium-sized boxes because they would be easier to lift. Wrap neatly everything in bubble wrap and place it in the container, be careful, your goal is to put everything in a way that will allow the even distribution of the weight. Make sure to use enough padding in order to avoid the bumping of the dumbbells in one and other. You don’t want to damage them during the move. Sometimes house relocations to London can take up to a week, so you have to make sure your gear is safely secured inside its transportation boxes. 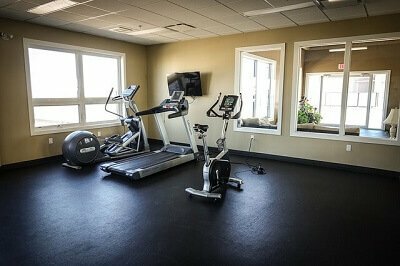 Here is the big problem, how to move your treadmill, elliptical or stationary bike without damaging them in the process. This will be a workout on its own. Treadmill. This is the heaviest of all house fitness gear, and you need to be careful not to injure yourself during the packing and moving. Unplug all wires and either tape them to the body of the treadmill or place them in a ziplock bag. Then fold the treadmill up and lock it into place. Wrap it in blankets and then with bubble wrap and tape. You need to be sure it won’t get damaged during the move. Ellipticals. With this one, you need to get your tools out and disassemble it. Take the handlebars and pedals apart from the main base. This way it will be easier to pack and transport it. Collect all the nuts and bolts and place them in a ziplock bag, if you are unsure of your abilities to assemble it back, take some photos that will indicate to you what goes where. Wrap the handlebars and pedals separately in towels or sheets that in bubble wrap. Do the same with the body of the elliptical. Stationary bike. The good news is that this is the lightest of the three, and you don’t have to disassemble it to transport it safely to London. Use the described method with blankets and bubble wrap and you are ready. When loading your gear into the truck make sure you place some cardboard sheets under the equipment, to prevent scratches and chips.